Semi-final weekend for the Suffolk Women’s County Cup, the final to be held back at Ipswich Town FC’s Portman Road Stadium on Tuesday May 7th. Ipswich Town Women will be their once again as they look to keep thier hands firmly on the trophy in a competition they have dominated in recent seasons. Are through to the final without kicking a ball after opponents AFC Sudbury Ladies took the decision to withdraw from the competition, the ERWFL Premier Division side having a tough season struggling with numbers and injuries. 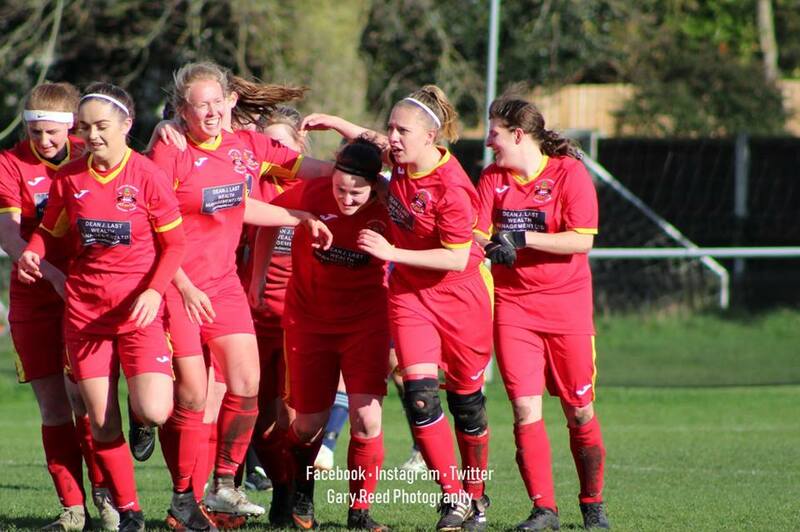 Contesting the other semi-final were Haverhill Rovers Ladies leading the Cambridgeshire Women’s Championship South up against Needham Market Women top of the table in the Suffolk Women’s Division going into the match. Both making their debut season in women’s football a huge incentive a place in the County Cup Final at Portman Road for the winners. Played at a neutral venue Long Melford FC, Stoneylands Ground. A well contested match placed in front of a crowd of over 300, it was Needham Market who came out on top to win the game 4-1 and book their place in a 2nd final of the season. Currently the treble is on for Needham Market but no matter how thing’s go from here it’s a season that will live long in the memory. Whilst Needham Market Women were writing another chapter in their short history, their title rivals in the Suffolk Women’s Division, East Bergholt United Ladies were playing their vital game in hand at home to Woodbridge Town Ladies on Sunday. Level with Needham Market at the top a positive result would see them move clear of their rivals with both having 5 left to play. Just the one league defeat to date East Bergholt made no mistake getting the 3 points thanks to a 4-0 win. Elena Nitsche scoring a brace, along with a goal a piece for Annie Northwood and Stacey Teager. 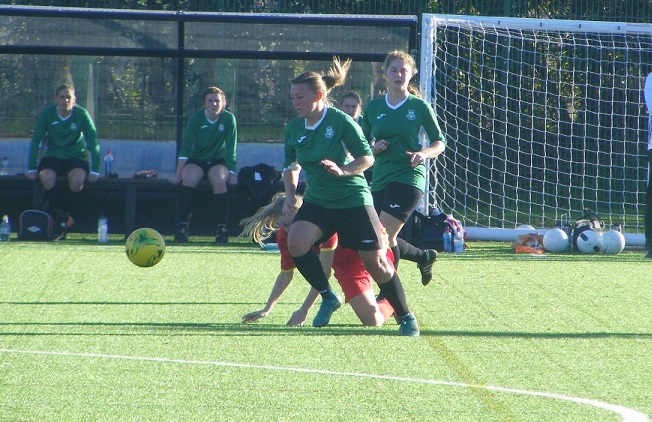 Lauren Page was on target for a hat-trick on Sunday her first goals for Brantham Athletic Ladies as they came home with the 3 points comfortably beating bottom side University of Suffolk Women. Along with Page’s hat-trick their was all a brace for Shanice Leeks with Carra Marie Seeley also getting a goal. 3rd placed Brantham Athletic winning 9-0, Toni Mott and Jessica Ryan on the scoresheet too celebrating their first goals. Coplestonians Ladies were also in action at the weekend at home to Walsham Le Willows Ladies in the Suffolk Women’s Division. Goals from Abigail Eley her 10th of the season, along with a first for Coplestonians for Ashley Bustos and a strike from Sophie Allen seeing the home side leading 3-1 at half-time. Laura Brame on target for Walsham Le Willows, pulled it back to 3-2 in the 2nd half with her 25th goal of the season, it wasn’t enough however as Coplestonians held on to take the 3 points. This entry was posted in Suffolk Women's County Cup, Suffolk Women's Division, The Round-Up and tagged Suffolk Women's County Cup, Suffolk Women's Division, The Round-Up on March 19, 2019 by WFEast. Quarter finals weekend for the Suffolk Women’s County Cup competition. Ipswich Town Women with an iron grip of the trophy winning six of the last seven finals. This Sunday also the start of a new era for the club with Carla Dickinson stepping down as head coach in mid-week U21s coach Joe Sheehan to the 1st team mangers role. His first game in charge Ipswich’s home quarter final tie against Suffolk Women’s Division side Brantham Athletic Ladies. A 3 league gap between the sides a big gulf. Ipswich getting off to a great start their new signings Amy Nash and Georgia Box combining in the opening 5 minutes for Box to open her account for Ipswich. Toni-Anne Wayne doubling the lead on 15 minutes firing the ball home to make it 2-0. Captain Cassie Craddock quickly adding a 3rd to the home sides tally. Paige Wakefield scoring Ipswich’s 4th on 23 minutes Craddock with her 2nd before the half hour. Full back Jac Ball bombing forwards and shooting on the scoresheet to bring up a 6th goal in the 35th minute. Natasha Thomas scoring on the stroke of half-time to see Ipswich leading 7-0 at the break. Five changes at half-time for Ipswich, Brantham to their credit putting in the hard work keep going, keeping the hosts at bay till the 65th minute with Wakefield scoring her 2nd of the match an overhead kick inside the area. Craddock volleyed in her 3rd to complete a hat-trick. Nash finding the back of net for Ipswich’s 10th and her 1st for the club. Into the last 10 minutes, both Wayne and Thomas adding another goal each with Amanda Crump back with a stunning left foot strike. Box wrapping up a 14-0 result with her 2nd goal in the last minute. Ipswich comfortable into the last 4 once again. AFC Sudbury Ladies were beaten by Ipswich Town Women in last two County Cup Finals the ERWFL Premier Division side drawn away to Coplestonians Ladies in the quarter finals of this season’s competition. 2 leagues between the sides Sudbury have been struggling for league form the County Cup different as they progress with a comfortable result, Emma Squirrel opening the scoring for the away side, Mia Etheridge doubling the lead, both players going on to score again. 4-0 up Olivia Gunn struck home for her 1st goal of the season to make it 5 with Ellie Mitchell making 1st appearance for the club scoring on her debut. 6 goals and a clean sheet for Sudbury. The top two in the Suffolk Women’s Division were drawn together in the quarter finals of the County Cup this Sunday with 2nd placed Needham Market Women full of confidence after a fantastic first half of the season at home to East Bergholt United Ladies very strong themselves top of the table with a 100% record. An attacking game from both sides plenty of goalscorers amongst them, a 3-0 lead for Needham Market certainly caused the eyebrows to raise when I saw it on twitter. East Bergholt fought hard to get back into the game and pulled it back to 3-2, Needham Market’s keeper with a late save to deny them a 3rd as Needham Market knock them out of the competition to reach the last 4 of the County Cup in their debut season. In the other quarter final game in the Suffolk Women’s County Cup two sides were meeting who too were making their debut seasons with Woodbridge Town Ladies at home to Haverhill Rovers Ladies the latter playing over the border in the Cambridgeshire Women’s Championship South leading the table it was a close match between the sides that when all the way to a penalty shootout with the game ending all square at 1-1 heading to a penalty shootout Haverhill the side emerging victorious to reach the semi-finals going through with a 4-2 win. As well as the County Cup quarter finals there were also two matches taking place in the Suffolk Women’s Division on Sunday. With 3 of the top 4 in the league playing in the competition 3rd placed Alresford Colne Rangers won their 10th game of the season to open up a 5 point gap between themselves and 4th placed Brantham Athletic with a comfortable away win against Chantry Grasshoppers Ladies at the weekend. Alresford having a good spread amongst their goal scorers with most on the scoresheet this season. Were without top scorers Tiffany Reeves and Jo Harvey this Sunday others contributing in their stead Alresford winning 6-1 with six different players celebrating a goal, Leia Rudge, Ellie May Griggs, Lucie Stanbury, Donna Leggett, Laurel Harknett & Abigail Chambers with her 1st of the season. Charlotte Archer scoring the goal for Chantry Grasshoppers. In the other game played in the Suffolk Women’s Division on Sunday Leiston St Margarets were at home to Walsham Le Willows. A hat-trick for Lucy Eagle taking her onto 19 goals for the season along with a 13th goal of the season for Thalia Cloke seeing Leiston St Margarets win the game for one to climb above Walsham Le Willows into 6th place on the table. Laura Brame and Norma Locker scoring for Walsham Le Willows. This entry was posted in Suffolk Women's County Cup, Suffolk Women's Division, The Round-Up and tagged Suffolk Women's County Cup, Suffolk Women's Division, The Round-Up on February 20, 2019 by WFEast. A 12:00pm on Bank Holiday Monday at Colchester United FC saw Ipswich Town Ladies taking on AFC Sudbury Ladies in this season’s Suffolk Women’s County Cup Final. 3 successive wins for Ipswich Town Ladies they were looking to make it 4 in row on a very hot Bank Holiday. It was ERWFL Premier Division side AFC Sudbury who took the lead Sophie Jeffery scoring direct from a corner in the 18th minute. Ipswich Town were level just a minute later Natasha Thomas making it 1-1. Ipswich came close to taking the lead striking the cross bar twice before captain Amanda Crump did score in the 35th minute to make it 2-1 the bar struck for a 3rd time Ipswich Town holding the narrow advantage at half-time. 10 minutes into the 2nd half Sophie Welton found the back of the net to make it 3-1 to Ipswich Town. Defender Lindsey Cooper heading home Ipswich Town’s 4th goal on the hour. Thomas with her 2nd of the game making it 5-1 five minutes later. Ipswich going on to seal the win and make it 4 in a row. 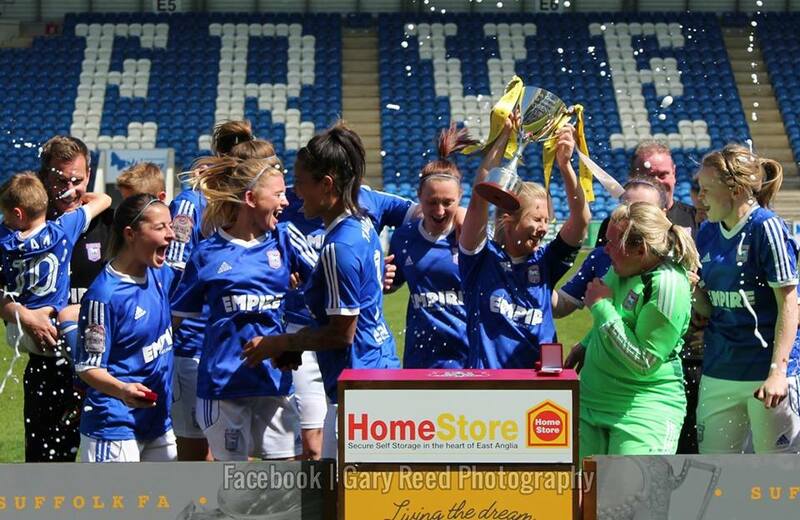 Congratulation’s to Ipswich Town Ladies on their County Cup success. One game played in the Suffolk Women’s Division, Brantham Athletic Ladies playing their final game of the season away to Leiston St Margarets. A chance to pull level with leaders East Bergholt United Ladies who have a game left to play, Brantham had just the 10 players available but a battling performance saw them share the points with Leiston St Margarets in a 1-1 taking Brantham 2nd. Bacton United Ladies 3rd & Walsham Le Willows in 4th can catch them with their remaining fixtures. Michelle Stanborough the scorer for Leiston St Margarets. Most sides have 1 game left to play Walsham Le Willows Ladies have three one of which is against East Bergholt United Ladies. This entry was posted in Suffolk Women's County Cup, Suffolk Women's Division, The Round-Up and tagged Suffolk Women's County Cup, Suffolk Women's Division, The Round-Up on May 9, 2018 by WFEast. The Suffolk Women’s County Cup Finals were played this Sunday after both were called off last weekend. At neutral venues, Ipswich Town Ladies the current holders of the competition were playing ERWFL Division One North side Ipswich Wanderers Ladies. Initially the tie did start last Sunday, Jordan Arnoup from the penalty spot putting Ipswich Town ahead in the 16th minute but conditions were deteriorating and when an Ipswich Wanderers player was injured the game was abandoned the sides set to try again this Sunday. Ipswich Town again getting in front inside the opening 15 minutes Sophie Welton scoring the goal. Ipswich Town fashioned further chances in the 1st half but weren’t able to extend their lead as Ipswich Wanderers held them to 1-0 at the break. Ipswich Town had a much better 2nd half Miagh Downey doubling their lead 5 minutes into the half. Zoe Cossey and captain Amanda Crump added a goal each to see the lead 4-0 on the hour. Welton with her 2nd of the game making it 5-0 to put Ipswich Town in full control of the tie. Natasha Thomas making it 6-0 with 15 left on the clock Cossey added her 2nd of the match late on to make the final score 7-0 to send Ipswich Town into their 4th successive final. Ipswich Town’s opponents in the Suffolk Women’s County Cup Final will be AFC Sudbury Ladies after the ERWFL Premier Division side beat Suffolk Women’s Division side Leiston St Margarets Ladies. Two league between the sides, Leiston St Margarets have been in great form AFC Sudbury taking nothing for granted opened the scoring midway through the 1st half, Rebecca Chandler getting the goal. Phoebe Guiver also scoring in the 1st half to see AFC Sudbury leading 2-0 at half-time. Striker Stacey Teager coming on in the 2nd half netted a brace to double AFC Sudbury’s lead the final score 5-0 with Sophie Jeffery netting a goal in the last 15 minutes. Two matches played in the Suffolk Women’s Division at the weekend. After 4 successive draws in the league, leaders East Bergholt United Ladies finally got back to winning way away to AFC Kesgrave Ladies on Sunday. All the goals coming in the 1st half Charlotte McGrath, Annie Northwood and Millie Wilding all finding the back of the net in a 3-0 win. A comfortable win at home for Brantham Athletic Ladies on Sunday sees them climb back above Bacton United Ladies into 2nd spot in the Suffolk Women’s Division table. Were taking on Ipswich Athletic Youth Ladies. Goals from Lucy Dunnett, Kirsten Hutchings, Carra Marie Seeley and Jodie Sharp plus a brace from Danielle Harvey seeing Brantham Athletic run out 6-0 winners. This entry was posted in Suffolk Women's County Cup, Suffolk Women's Division, The Round-Up and tagged Suffolk Women's County Cup, Suffolk Women's Division, The Round-Up on March 28, 2018 by WFEast. Two quarter final ties to be decided in the Suffolk Women’s County Cup this Sunday. Lowestoft Town Ladies game postponed due to them being involved in FA Women’s Cup action last Sunday eventually going out to fellow FAWPL South East Division One side, Norwich City Ladies. Were to play extra-time for the 2nd cup game in a row this Sunday, Norfolk Division One side Bungay Town Ladies the visitors to Crown Meadow the result tied at 2-2 after 90 minutes, Lowestoft Town’s fitness telling in the extra half hour as they went on to win the game 4-2 will now played Suffolk Women’s Division side Bacton United Ladies in the semi-finals. Gemma Moore with 2 goals for Lowestoft with captain Hannah Waters and Aimee Durrant also scoring. In the other quarter final tie to be played Suffolk Women’s Division leaders, Walsham Le Willows Ladies were at home playing ERWFL Division One side, Ipswich Wanderers Ladies the visitors setting up a show down in the semi-finals with holders Ipswich Town Laides winning the game 3-0 with 2 goals from Tarnya McKew and a goal for Michelle Taylor-Allum. Two games in the Suffolk Women’s Division on Sunday and with Walsham Le Willows in County Cup action 2nd placed Ipswich Town Ladies Development level on points with Walsham Le Willows, moved 3 points clear at the top winning away from home against East Bergholt United. Their goalscorers, Florence Cage, Sian Cottrell, Jennifer Purbrook and Emily Steward seeing them win the match 4-1. Jessica Oxlade on target for East Bergholt United. Remember Copleston Ladies? they were finally back in league action on Sunday playing just their 3rd league game of the season! Having previously lost their opening 2 matches got themselves a much needed win at the weekend and their 1st points on the board where at home playing Leiston St Margarets Ladies, scoring 2 goals in each half to win the game 4-0. Jemma Wessels netting a brace with Sophie Crane and Elysia Young also grabbing a goal each. This entry was posted in Suffolk Women's County Cup, Suffolk Women's Division, The Round-Up and tagged Suffolk Women's County Cup, Suffolk Women's Division, The Round-Up on November 30, 2016 by WFEast.